Get into the Valentine spirit with this adorable cake topper from Dina Nakad of Miettes. Follow these easy steps and create a gorgeous little Teddy bear, heart cake topper- perfect for all your Valentine cakes. Roll out your red fondant to a 1/3 thick. Cut with a heart cutter (size depending on what you like) – I have used a 7cm heart (widest part) or approx. 2.75 in width. To make the face, you will need brown fondant and light pink – as shown in the picture. Using the large ball for the face, use a small ball tool to make the eyes, then add 2 pieces of black fondant in the sockets. Then add the nose. Using a tool (as shown) or a small knife, make an indentation to form the mouth. For the paws, you will need 2 brown balls, then shape the ball as shown in the picture. With the same ball tool, make indentations for the paws. Position the face and paws as shown. To make the ears, take the small ball and flatten a bit, flatten the light pink ball and glue to the brown one, then position on each side of the face. This picture shows you how to make the small bow next to the ear. To make the big bow, you will need 2 balls, each rolled in a snake shape, thicker in the middles and curved as shown in the picture, one on each side. And for the ribbon, just roll 2 balls, each in a snake that you will twist before adding. Mix a little bit of white edible powder with clear alcohol and with a tip of a toothpick, put some dots on the ribbon. Also, add on eyes and nose as shown. Pic 15 – Final look. 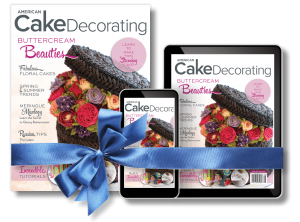 My love for healthy cooking and baking embarked me on the journey of cake decorating and I founded my home-based business “miettes” which means crumbs in French. I am totally self-taught and I rely on online classes and tutorials to learn new techniques. I like simple yet elegant designs with a twist or originality. 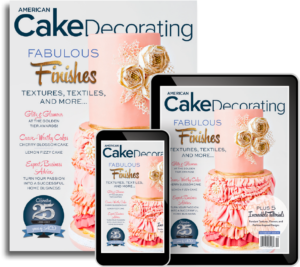 My cakes have been published in esteemed cake decorating magazines such as American Cake Decorating, Cake Masters, Cake Design France, Party Cakes and Wedding Cakes & Sugar Flowers. I am the ambassador for the Laped Italia brand in Lebanon.